A nighttime foray into the woods surrounding Bachelor's Grove Cemetery near Midlothian has become a sort of "rite of passage" for teens growing up in the Southland, according to a ghost tour participant on Sunday. The long-closed facility, famous for being supposedly haunted, was one of several stops during a daytime ghost tour with renowned Chicago paranormal researcher Ursula Bielski. The tour was put together by organizers at the Green Hills Library in Palos Hills and its 50 available bus seats were quickly sold out. Rubio Woods, which surrounds Bachelor's Grove, is closed at night and its perimeter is heavily patrolled by police. But nighttime seems to be when most of the strange experiences are reported. "It's one of the most haunted places in the world," Bielski said. Bielski, who's been researching the paranormal for about 30 years in the Chicago area, said her strangest experience in Rubio Woods was in 2012. During an investigation there, she said, she saw strange lights in the woods and started to follow them. "I got lost," Bielski said. "It was really one of the most terrifying things that's ever happened to me." Some of the other strange sightings reported in the woods, she said, include a cabin that disappears, and an old black stagecoach and 1970s-era vehicles that appear and disappear. She said others have reported a woman in white wandering the woods looking for her baby. Bielski suggested some of the paranormal energy in the woods could come from it once being land that was considered sacred to Native Americans. She said Prohibition-era mobsters also would dump bodies riddled with bullets around the woods. Tour participant Paul Kapelinski, of Palos Hills, shared his strange experience walking on the trails through the woods with his mother and sister. "We felt like (the woods) were closing in around us," he said. "It's hard to describe. It was a dark feeling." Another tour stop was at St. James Catholic Church and Cemetery in Lemont, where Bielski's ghost stories also included a history lesson. She said the gates at the cemetery were the ones that were used at Hawthorne Works by the Western Electric Company in Cicero, which closed in 1983. That company hosted an ill-fated employee excursion aboard a ship called the Eastland in 1915, which resulted in 844 deaths after the overburdoned ship rolled over in its Chicago River berth. Most of the dead were Western Electric workers and their families, Bielski said. She suggested the gates could be one reason why the area is an active ghost site. But one of the oldest ghost stories from the cemetery, Bielski said, dates back to the mid-1800s. She said workers digging the Illinois & Michigan Canal stayed at the cemetery overnight rather than heading back to Chicago, but they couldn't sleep because they kept hearing a mysterious horse carriage that they never spotted. Bielski said the workers did see a woman in white rise up from the cemetery and glide right through the fence and onto Archer Avenue. The ghostly woman in white seems to be a precursor to one of the most famous purported ghosts in the Chicago area — Resurrection Mary, who, before the Willowbrook Ballroom burned down last October, was still very active at the site, according to Bielski. She said men have reported dancing with the apparition, who was "cold to the touch" and "socially cold," up until the last week the facility was still standing. Another "haunted" site is just across the street from the former ballroom. Bielski said the spirits of children of prostitutes who died from disease are reported to haunt The Irish Legend in Willow Springs. She said the building was once used by Al Capone and there was a tunnel connecting The Irish Legend and the ballroom to allow gangsters to escape during police raids. Some people on Bielski's tour were hoping to experience some of the frights for themselves. "It seemed like a fun thing to do," said Dan Lenard of Palos Hills. "I've got my hopes high to see some ghosts." 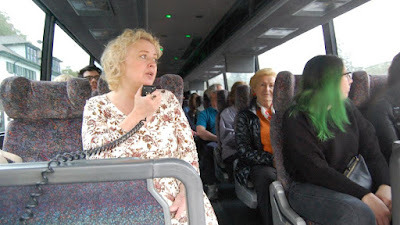 Most of those on the tour were those who have read some of Bielski's books or watched her on TV shows talking about Chicago area hauntings. "I wanted to experience this in person," said Bonnie Morris, of Munster, Ind.